Stepping out of the TARDIS into Victorian London, Leela and the Doctor are confronted by menacing, diabolical horrors shrouded within the swirling London fog - a man's death cry, an attack by Chinese Tong hatchet men, giant rats roaming the sewers, young women mysteriously disappearing...The hideously deformed Magnus Greel, conducting a desperate search for the lost Time Cabinet, is the instigator of all this evil. Posing as the Chinese god, Weng-Chiang, Greel uses the crafty Chang, and the midget manikin, Mr Sin, to achieve his terrifying objectives. 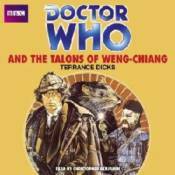 The Doctor must use all his skill, energy and intelligence to escape the talons of Weng-Chiang. Christopher Benjamin, who played Henry Gordon Jago in the original BBC TV serial, reads Terrance Dicks' complete and unabridged novelisation, first published by Target Books in 1977.